Third-generation woodworker Ryan Leake brings adventure to the kitchen with this magnetic rack. 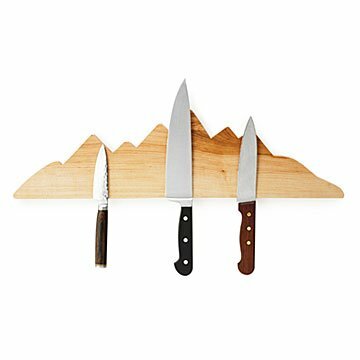 Bring a taste of wilderness adventure to your kitchen with this handcrafted, wooden knife rack. Made by Ryan Leake, a third generation woodworker, the wall-mounted panel is cut to resemble a mountain range, and appears to be simply a handsome decorative accent. But hidden beneath the surface is a powerful neodymium magnet that will hold kitchen knives up and out of the way, making them easier to find and safer to reach for than in your kitchen drawers. The magnetic surface can also be used to hold your keys, hand tools, or other metal items you need handy. The maple surface is finished with food-grade butcher block polish, and with just an occasional wipe of mineral oil it will keep your eyes on the mountains for years to come. Comes with mounting hardware. Handmade in New Mexico. Ryan Leake (known as Ringo) practically has sawdust in his blood. He’s a third-generation woodworker, and he spent many years working alongside his father building custom, high-end display tables for art galleries and collectors. But more recently, Ryan’s creative and business instincts have taken him on a different path. He wanted to create something beautiful but practical, and accessible to more people. Inspiration struck in the kitchen—where he loves to cook—in the form of a handcrafted, magnetic knife rack. Now Ryan is able to share his stylish, rustic creations with people not just in his home state, but around the world. Hand wash with dish soap. Holds knives of up to 5lbs. Mounting hardware (2 screws & 2 plastic sheet rock anchors) included. Used to store kitchen prep knives so they are handy and available when needed. Wish the one I purchased had some sort of wood grain prominent like the photo. I love how easy it is to use, just hang it or set it on counter and your knives magnetically stick. All you need to hang it comes with. We were so excited to receive this piece. When it showed up, it didn't have any color differentiation to the grain. It looked like a cheap piece of fake wood product I could have bought at Walmart. The finish was extremely shiny. I was really disappointed with this product. In the picture it shows a gorgeously grained piece of wood, with lighter hues warming towards the peaks. The piece I received is a uniform bland colour. I understand that due to the nature of wood, no two pieces will look alike, but I had expected a similarly attractive piece of wood to be chosen for each piece. I wanted to give this as a gift to my chef boyfriend, but it's not the elegant kitchen statement piece I thought it was. It looks cheap and I will be returning it promptly. I loved the mountain range shape. Would love to see similar types of products. I was so excited about getting this for my fiancÃ©, but unfortunately the magnets are not strong enough to hold up our chef knife. This was very disappointing. I even tried adding more magnets to the holes where the current magnets are to make it stronger, but nope.. no such luck. It still does not hold up the knife. I will regretfully have to return this item. We just renovated our kitchen ourselves and I didn't think it could get any cuter but this proved me wrong. Beautiful design and use! Totally freed up some counter space and looks even cooler on the wall than it did in the pictures. I'm in love. The quality is exceptional and I should know. I have several woodworkers in my family and I also dabble. I'm very happy I found your website.